The Illustrated Bible Dictionary,[a] better known as Easton's Bible Dictionary, is a reference work on topics related to the Christian Bible compiled by Matthew George Easton. The first edition was published in 1893, and a revised edition was published the following year. The most popular edition, however, was the third, published by Thomas Nelson in 1897, three years after Easton's death. The last contains nearly 4,000 entries relating to the Bible. Many of the entries in Easton's are encyclopedic in nature, although there are also short dictionary-type entries. Because of its age, it is now a public domain resource. ^ Full title: Illustrated Bible Dictionary and Treasury of Biblical History, Biography, Geography, Doctrine, and Literature with Numerous Illustrations and Important Chronological Tables and Maps. ^ a b Easton (1893). Easton, Matthew George, ed. (1893), Illustrated Bible Dictionary..., New York: Harper & Bros.
Easton, Matthew George (1897). "Table of contents" . 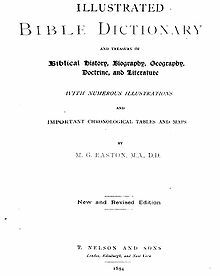 Easton's Bible Dictionary (New and revised ed.). T. Nelson and Sons. Igor Apps, Bible Dictionary (Contains: Webster's 1828 Bible Dictionary, Easton's Bible Dictionary, Smith's Bible Dictionary, KJV Bible), Google Play Store Android app. Igor Apps, Bible Dictionary (Contains: Webster's 1828 Bible Dictionary, Easton's Bible Dictionary, Smith's Bible Dictionary, KJV Bible), iTunes Store iOS app.